Something’s abuzz at the AJ Fletcher Foundation! Earlier this week, representatives from Bee Downtown installed a brand new honey bee hive at our offices in Raleigh. This installation is part of Bee Downtown’s efforts to raise awareness of the global decline of the honey bee population and promote sustainability by placing hives in cities, where bees can thrive. Honey bees are responsible for pollinating almost 80 percent of all vegetable, fruit, and seed crops in the United States. The AJ Fletcher honey bees will help build the local honey bee population and pollinate flowers all across the city. According to Bee Downtown Founder and CEO Leigh-Kathryn Bonner, rooftops in urban areas are great places for honey bees because they are farther from pesticides and they make use of what would otherwise be wasted space. On Tuesday, we had the opportunity to watch the installation and learn more about the bees. We are so delighted to be able to play a part in sustaining a healthy ecosystem. In the words of Leigh Kathryn, “If we can work together like a beehive, we can make a collective impact that we can all be proud of.” And if you’d like to keep up with Bee Downtown and the work that they do, be sure to check out their website! 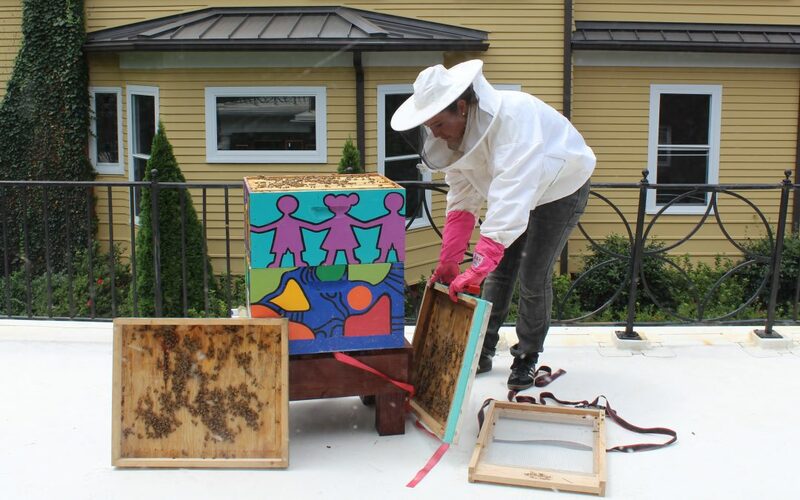 Featured image: Leigh-Kathryn Bonner, Founder and CEO of Bee Downtown, installs a beehive on our rooftop.